The early history of Spring Training in Mesa runs through Rendezvous Park. Enjoying a nearly 80 year run of baseball, Rendezvous Park was called the Jewel in Mesa's crown. Playing host to both the Chicago Cubs and later the Oakland Athletics, Rendezvous park is an essential part of not just Cactus League Baseball history, but also the history of Mesa. The city of Mesa enjoys a 90 year history of Baseball. With the Chicago Cubs and Oakland Athletics thrilling crowds from late February through early April every year, it can be easy to forget that the sport of baseball has made its presence know for nearly a century. The start of that history lurks in a forgotten and demolished piece of land: Rendezvous Park. As early as 1895 when Depot Park, as it was known then, was born as a place for local residents to enjoy an afternoon stroll or a game of sport. By statehood in 1912, the park found itself with a new name, Drew Park, and a fledgling tradition of baseball. With huge grassy fields and plenty of eager players, baseball quickly grew to become a crowd pleaser. Exhibition games between local teams thrilled crowds. However, these exhibition matches between amateurs were a far cry from the professional contests being played on the east coast. While baseball was a popular game at the newly christened Rendezvous Park, its chief purpose remained as a recreation facility. Park goers spent more time bathing in the pools or skating in the roller rinks than they did watching or playing baseball. The arrival of the Chicago Cubs to Mesa in 1952 drastically changed the perception of baseball in Mesa. The games at Rendezvous Park no longer smacked of unprofessionalism. Now the park played host to professionals, players and names that many fans recognized from radio broadcasts of games. Names such as Monte Irvin and Ernie Banks quickly became fixtures in the city of Mesa, Particularly Banks, who would spend his entire career with the cubs, and most of that time Spring Training in Mesa. Dwight Patterson, an eccentric local rancher, had somehow managed to convince the owner of the Chicago Cubs to leave their spring training home on Catalina Island. Patterson did not think the task was too difficult and was quoted as saying, “It is hard to get anyone to play at Catalina,” citing the bad weather and remote location of the island from other teams. For the next quarter century, the baseball fields at Rendezvous Park would play host to hundreds, if not thousands, of Cactus League Games. The Giants, first of New York and later of San Francisco, Indians, and Orioles were common early opponents for the Cubs. However, after nearly a decade and a half at Rendezvous Park, the Chicago Cubs abruptly abandoned the City of Mesa for Long Beach, California, leaving Dwight Patterson, and the City of Mesa, shocked. Having expressed concerns over ticket sales the previous season, the Cubs decided to leave Mesa behind and try its luck elsewhere. Rendezvous and Mesa would be without a tenant for only one spring, as in 1967, the Kansas City Athletics moved to Mesa and became the third team to join the Cactus League that year. The A’s time in Rendezvous Park was short, but prolific. After only five years, and a change of address to Oakland, in the Valley of the Sun, the A’s would win the World Series in 1972, and then again in 1973 and 1974. The A’s, with stars such as Arizona State Alumni Reggie Jackson and Rollie Fingers, enjoyed immense popularity at Rendezvous Park. The A’s tenure at Rendezvous was short lived. 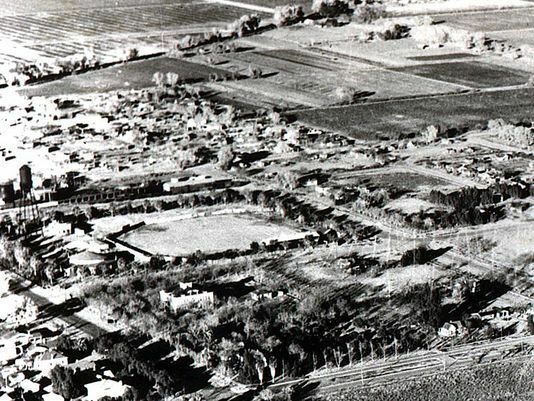 By 1976, Hohokam Stadium was completed and the A’s moved one mile north to the new facility. By now woefully outdated and with a new stadium just constructed, Rendezvous Park had little chance to attract a new tenant. Razed not longer after the completion of Hohokam Stadium, Rendezvous Park lives on in the memories of baseball fans. 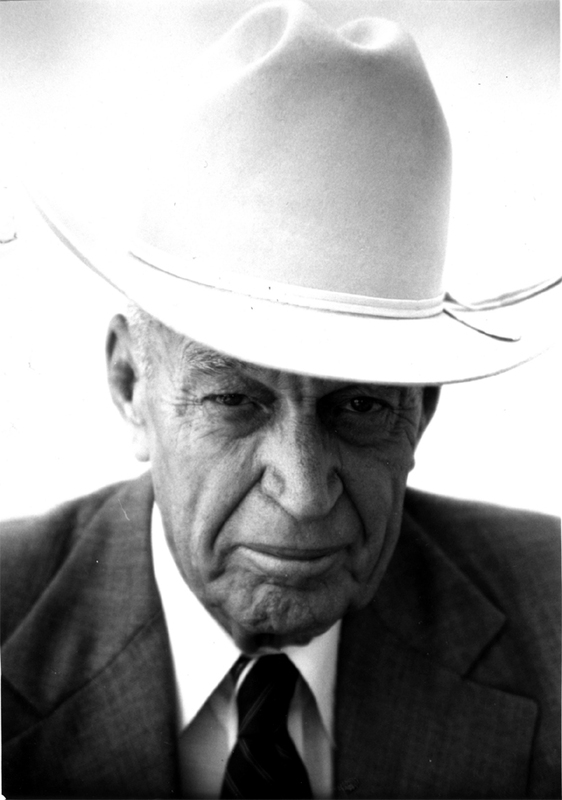 Mesa rancher and the "father of the Cactus League" Dwight Patterson: Dwight Patterson was an enigmatic and stoic man. Patterson's work to bring the Cubs to Arizona not only helped to kick start the Cactus League, but also brought the state a fan favorite for many years to come. ~ Source: Historical League, Inc., Arizona History Makers Biography, credit Kelly Holcombe; (https://www.historicalleague.org/historymaker-inside.aspx?historymakerid=40: Accessed Novemner 15, 2016.) ~ Date: n.d.
Cubs players Pat Malone, Charles Root and Gabby Hartnett on Catalina Island. 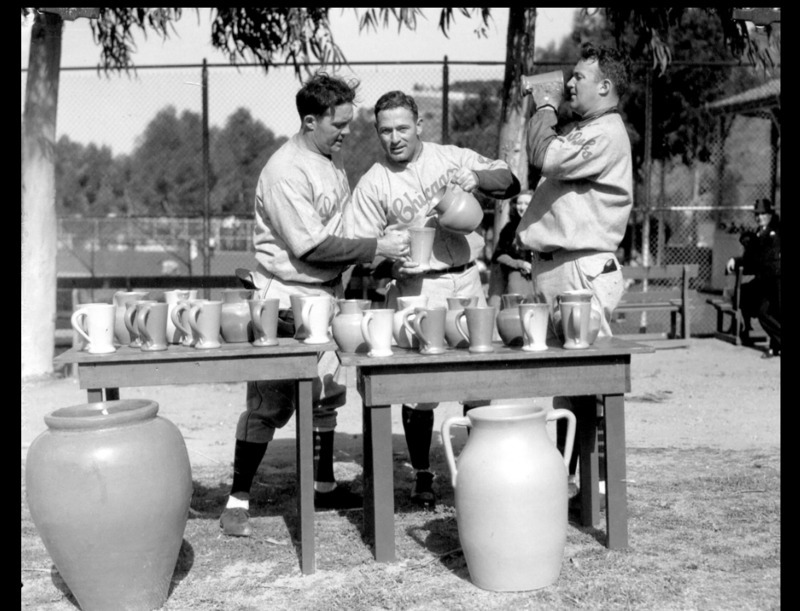 : This photograph shows Pat Malone, Charles Root and Gabby Hartnett enjoying a quick refreshment break as they train on Catalina Island. The players often spent more time taking breaks and enjoying the local scenery than preparing for the baseball season. ~ Source: [The Cubs players Pat Malone, Charles Root and Gabby Hartnett on Catalina Island. ], photograph, date unknown; Catalina Island, California. ( http://www.nytimes.com/slideshow/2016/10/18/sports/baseball/the-cubs-and-catalina/s/19catalinaSS-slide-HCWY.html: Accessed November 15, 2016) New York Times; crediting Catalina Island Musuem. 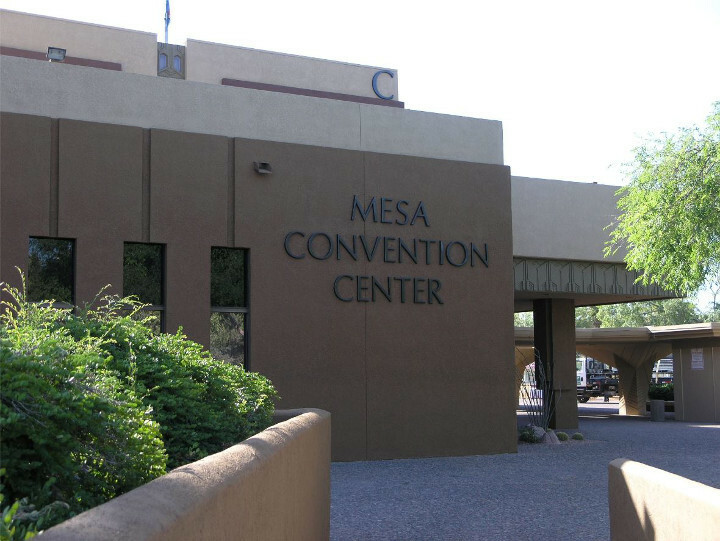 Mesa Convention Center: The Mesa Convention Center now stands where Rendezvous Park once did. Connor Hillmann, “Rendezvous Park,” Salt River Stories, accessed April 18, 2019, https://saltriverstories.org/items/show/204. Arnott Duncan, "Cubs, Giants Plan Work for Monday," Arizona Republic (Phoenix), February 17, 1952. Susie Steckner, Cactus League: Spring Training (Charleston, SC: Arcadia Pub., 2012).